Like many other aspects of your business, the key to truly effective email marketing is to focus on the customer. Below you'll find some tips from Newsletter2Go's Annemarie Lennicke on how to improve customer retention in the long term and boost sales with email marketing. Before you can even begin thinking about sending emails, you need to have a list of contacts (leads) to send them to. It's important to note here that you'll need the customer's permission in order to send them emails. If you want to play things on the safe side, I recommend using double opt-in for this. With double opt-in, when a customer signs up for your newsletter, he or she is sent an email containing a link which the customer must click in order to confirm that he or she actually wants to receive your newsletter. Only once they've confirmed can you start sending them your newsletter. Sign-up forms like this are easy to add wherever you want. Of course, you can also purchase leads. But I wouldn't recommend doing this, since you can never be certain if the customer is even in the market for your products or services or whether the addresses were collected legally. Marketing automation is the best way to stay in touch with your customers without completely spamming them with newsletters. With automated emails, you first create the newsletter you want to send, then you designate a specific point in time when you want it to be sent to your customers. There are also different triggers which can be used with automated emails. Holidays, for example, are usually a good occasion to run new email campaigns. Birthdays and other personal events are great, too. To use these triggers, you'll need to request some personal information from your customers when they sign up, such as their age, date of birth and gender. The first, and perhaps most important, email to send is a welcome email. When customers sign up for your newsletter, they're essentially telling you that they're interested in your products or services and are open to receiving more information about them. For this reason, you shouldn't waste any time following up with new subscribers. Establish contact as quickly as possible and show your customers that you appreciate their interest in your business with a special discount code. Welcome emails give you the opportunity to tell customers the most important things they need to know about your products and services in a neatly organized manner. You should also include links to your social media channels and support/help pages so that it's clear where you customers should turn if they have any questions. If your customers provide their date of birth during sign-up, you can use this information to send emails wishing them a happy birthday. This is a great way to show customers that you're keeping them in mind — especially on special days like this. You should try to make these emails as personalized as possible, and you can score extra points by creating special offers which are custom tailored to the recipient. And be sure to make it clear that the offer is a personalized gift! Everyone enjoys receiving emails that were written specifically for them since it makes them feel like they're more than just another customer in a massive newsletter campaign. Different parts of your newsletter lend themselves well to personalized text. The easiest part to personalize is the greeting/address. You can collect personal information from customers, such as their name, date of birth and age, during sign-up, and you can then use this information to personalize your newsletters. You can also personalize the content of your emails. If you are able to categorize customers into target groups or analyze purchase behavior, you can easily customize your emails to contain product or service recommendations which are perfectly tailored to each customer. Let's say you run a shoe shop. You could customize your newsletters, for example, to show women's shoes to female customers and men's shoes to male customers. Don't be afraid to ask your customers for feedback about your newsletter. This type of information is a great foundation for making adjustments and improvements to your emails. Asking for feedback is not only good for business — it also makes a good impression on customers by showing them that their opinion matters and that you trust their input. To get even more feedback, you can try offering small rewards, such as special discounts or gift certificates. 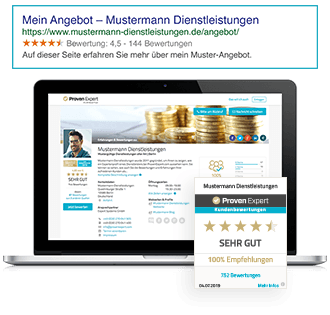 An easy way to ask your customers for reviews, ratings and feedback is to use rating tools such as ProvenExpert in combination with email marketing. 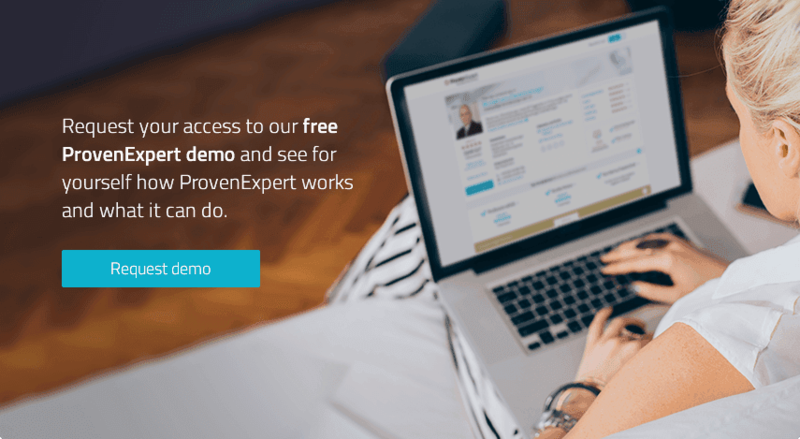 One way to get reviews and ratings is to put links to your ProvenExpert surveys in your newsletters and email campaigns. Don't simply link to your surveys, actually specify the type of feedback you're interested in getting: „"Let us know what you think about [specific service]! "“ You can then add your customer ratings to your ratings profile and seal on your website. Combining your email marketing with customer reviews and ratings lends a much stronger and more professional voice to your company communications. keep in mind that relevance is extremely important when creating newsletters. Recipients will only open your email if they feel the content is truly relevant and of interest to them, so you should strive to tailor your messages as much as possible to the needs and interests of your target groups. Show your customers that you value their opinion and ask them to give input and feedback on your newsletters. Get his or her attention and show them that there is value in reading your email. A simple „"Thank You"“ is a sure-fire way for your email to end up in the trash without it ever being read. „Asking your customers“ to help you create the best possible content for them sounds much more interesting and will more likely result in the email being read. Establishing long-term customer retention isn't difficult, and it's an essential part of successful email marketing. Combining email marketing with reviews and ratings helps you bring in new potential customers and create loyal regulars who are willing to sing your praises.